With Indage failing to make the payment for the prime land given to it at Pragatinagar and Nagwain for setting up wineries, the state government is likely to cancel the agreement signed with it after completing the formality of a personal hearing. The Dalai Lama today publicly appealed to the Tibetans both inside and outside Tibet to accept his decision to give up his political leadership in his effort to push for a full-fledged democratic system of governance for the Tibetan polity. The town, which remained home to noted ornithologist AO Hume, is finally awakening to the perceivable threat that its bird species faces from the onslaught of mindless urbanisation and modernisation. The controversy over the appointment of the controller of examinations (CoE) in the Himachal Pradesh University (HPU) has finally ended with the appointment of Narinder Awasthi as the new CoE. The government today ordered the transfer of four IPS and 12 state police service officers, including the police chiefs of four districts. Anurag Garg, IG (Headquarters), has been posted against the same post in the State Vigilance and Anti-Corruption Bureau. Having woken up from its slumber after an NGO released reports of toxic heavy metals in the air quality of the JP Cement Blending and Grinding Unit at Bagheri, the State Pollution Control Board has issued a 15-day show-cause notice to the plant for their failure to maintain ambient air quality in its administrative block. However, the quality of air in its other areas was found within permissible limits. British entrepreneurs will explore the possibilities of developing an international airport in the hill state, besides making investment in tourism, agriculture, horticulture and infrastructure building activities. A three-day international interdisciplinary conference on “The Character of Mind” commenced at the Indian Institute of Advanced Study, here yesterday. The chairperson of the State Women’s Commission, Ambika Sood, stressed on the need to educate women to make them aware of their rights in the society. She was addressing the students and the faculty at the Himalayan Group of Professional Institutions, Kala Amb, which concluded its week-long celebrations of the International Women’s Day on Wednesday evening. Chief Minister PK Dhumal today laid the foundation stone of Kala Manch in the chowgan. The manch will serve as a permanent venue for artistes to showcase their talent. The CM was also the chief guest on the last day of the Holi festival being celebrated in the sprawling chowgan here. “It is our duty to preserve our rich cultural heritage for future generations so that it benefits them just as it has benefitted us,” said Deputy Commissioner (DC) Ritesh Chauhan while inaugurating the two-day “lok kala” competitions in connection with the annual Nalwadi fair here today.More than 20 folk groups drawn from all parts of the district participated in the competitions. Holi celebrations were organised on the premises of the jail here today by the Department of Information and Public Relations. The purpose was to celebrate the festival with the inmates of the jail to bring them closer to the mainstream society. Plays and folk songs were the highlights of the celebrations. In the eye of a storm over the construction of a housing project in the midst of a thick forest in the town, promoters of Bemloi Development and Infrastructure Company Pvt Ltd today claimed that they had obtained all necessary approvals and no damage was being caused to the environment. Indage, with whom the agreement was signed in 2005, has been granted a personal hearing by the government on April 4. The government issued them two show-cause notices for violating the terms and conditions of the agreement. “Since the company has failed to make the payment through 10 annual instalments, we can easily cancel the agreement and take back the land which is under their possession,” said an official. The company has in its possession 55.7 bighas of land at Nagwain in Mandi and 14.10 bighas of land at Pragatinagar in Shimla. As per the terms and conditions of the agreement, the company was to make a total payment of Rs 1,00,85,479 for the Naghwain land and Rs 19,05,250 for the land at Pragatinagar in 10 equal instalments. Indage has so far deposited only a sum of Rs 20,17,096 for the Nagwain land and Rs 5,71,575 for the Pragatinagar land. Officials said since the company had failed to honour the commitment made in the agreement with regard to payment of money, the government could initiate legal proceedings against them and take the land back. The company had to return a sum of Rs 15 lakh, which was the government’s equity share in the project. It was the BJP regime which had signed the initial agreement with Indage in April 2000 for setting up of two winery projects. As per that agreement, 30 per cent each of share was to be of Indage and its foreign partner, 10 per cent of the Himachal government, 10 per cent of the HPMC and 20 per cent of growers. Unfortunately, the wineries never came up an in 2005 and the Congress signed a fresh agreement according to which the project was to come up in the private sector with no share of the government. However, even after the new agreement, the project failed to take off and now efforts are on to at least get the prime land back from the company. No work has been undertaken at Pragatinagar while in Nagwain, the company sold 54 quintals of grapes grown on a three-hectare patch to a private company at Shoghi. The public appeal came a day after the Tibet’s parliament-in-exile refused to accept the Dalai Lama’s proposal to formally legalise his decision by making necessary amendments in the Charter of Tibetans-in-exile to pass on his political authority to an elected leadership. Sources said only one Tibetan MP-in-exile supported the decision of the Dalai Lama to retire as political and constitutional head of the Tibetan government-in-exile. Refusing to accept requests by the Tibetans asking him to continue his political leadership, the Dalai Lama today reiterated that his decision was pragmatically aimed at benefiting Tibetans and their cause in the long run. “We are already in 21st century, and sooner or later a change has to come. 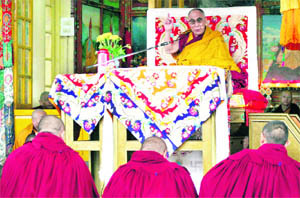 So we must prepare before it becomes too late,” the Dalai Lama said. The Dalai Lama, however, explained that devolving political role did not mean dissolving the Institution of the Dalai Lama (Ganden Phodrang) altogether. “The Ganden Phodrang as a spiritual entity will continue, but the institution’s political power will be relinquished,” the Dalai Lama said. “Himachal Birds”, a forum of bird lovers, has taken upon itself the responsibility to awaken the people of the hill state to save and protect birds before it is too late. 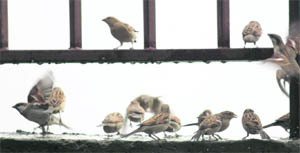 Studies undertaken by the State Pollution Control Board have indicated that the number of house sparrows and other small birds in Shimla is on a sharp decline. Even though experts point out that the study is inconclusive, it has been linked to the microwave towers that have come up everywhere. It only seems appropriate to launch a movement to save birds in the “Queen of Hills” which remained home to Hume, founder of the Indian National Congress who is widely respected as “Father of Indian Ornithology.” His home “Rothney Castle” located in the Jahku area had a priceless collection of thousands of bird species, which was later shipped to London and is now a part of the Natural History Museum. The programme to save and protect bird is the brainchild of a senior IPS officer, Somesh Goyal, under the aegis of “Himachal Birds”, which will be launched tomorrow. As a small beginning, the forum intends putting up 40 bird boxes in parks and open spaces in the state capital. “We will undertake an awareness campaign in schools so that schoolchildren can be educated about birds and the need for protecting them,” says Goyal. As part of the efforts, he intends teaching schoolchildren to make bird feeders out of plastic bottles, which can go a long way in increasing bird population in the state. “Even though the situation in Himachal is not as bad in most other places, we need to take steps to ensure that the bird population increases by creating habitat and food for them,” he emphasises. He says that small efforts like providing feed and proper habitat to birds can ensure a considerable increase in their numbers. The “Himachal Birds” proposes to take its message all over the state by having Chapters at the district-level. This initiative will include formation of more and more eco-clubs, encouraging nature walks, promoting bird activity and bird watching, especially among schoolchildren. Efforts are on to even rope in the Forest Department so that with their help and guidance more such activities can be taken up on a large scale. In certain parts of Shimla, especially on the outskirts, one can spot some of the most beautiful and rare birds. Meanwhile, Chief Minister PK Dhumal today gave a clarion call to the people of the state to save birds, flora and fauna to maintain ecological balance. He was speaking after inaugurating a three-day long photo exhibition jointly put up by Somesh Goel, Additional Director General of Police, Manjula Mathur, Gobind Bhardwaj and Umang Datt at Gaiety Theatre here today. The executive council (EC) of the HPU which met here today under the chairmanship of Vice Chancellor Prof SK Gupta informed that Awasthi had been appointed as the CoE following the interviews held on February 26. The EC also approved an annual budget of Rs 134.18 crore for the year 2011-12. It was also decided that the university would declare the results within 45 days of the completion of examination. RM Sharma, DIG (Prisons) has been posted as the DIG (Armed Police and Training). Sumedha Diwedi awaiting posting has been made the district police chief of Una. Veena Bharti, DSP (Nalagarh) has been posted as the Additional SP, Shimla. Among the Himachal Pradesh Police Service (HPPS) officers, Santosh Patial, Una, has been posted as SP, Bilaspur. Kapil Sharma, SP, Bilaspur, has been posted SP, Prisons. Chander Shekhar, SP, Baddi, has been posted as the SP, CID (Intelligence) in place of Bimal Gupta who has been made the SP of Lahaul-Spiti. Yashbir Singh, Commandant, 3rd India Reserve Battallion, Pandoh, has been posted as the SP, Human Rights Commission. SR Rana, SP, Lahaul-Spiti, has been posted as Commandant, IRB, Pandoh. DK Chaudhary on his return from the UN posting has been posted as the Commandant, IRB, Bangarh, Una. Gurdev Chand Sharma, Additional SP against the same post at Baddi-Barotiwala-Nalagarh. Madan Lal Sharma, Additional SP, Shimla, has been posted as Commandant, Home Guards, Shimla. Krishan Gopal Kapoor, Additional SP, Una, has been posted against the same post at Hamirpur. Ramesh Pathania is Additional SP at Una and Naresh Sharma, DSP, Vigilance Bureau, has been shifted from Mandi to Kullu. The notice issued on March 15, follows an air quality sampling conducted on March 8-9 following an NGO’s report which had detected the presence of heavy metals like lead, nickel, cadmium, manganese, etc., in two cement plants- the JP Cements and the Ambuja Cements. The ambient air quality of the Ambuja Cements was, however, found within permissible limits. The board, while terming the ambient air quality results as not confirming to the laid norms, stated that the devices were not operating properly. This was a violation of the Air (Prevention and Control of Pollution) Act, 1981, attracting punitive action under Sections 37, 38 and 39 of the Act which included a fine of Rs 10,000 or imprisonment of seven years or both. The board while directing the plant to improve its emissions and air control devices as laid down in the Environment (Protection) Rules, 1986, within 15 days had warned that if the compliance was not proper the unit could face disconnection of its power supply and even shut down of its plant. Interestingly, though the air sampling was taken from various parts of the unit, including clinker site, residential areas, only particulate matter in the administrative block had shown adverse results. The presence of lead was found in safe limits though as per the NGO’s report its level had far exceeded the permissible limit. The board officials, however, did not conduct sampling of other heavy metals, including nickel, sulphur dioxide, nitrogen dioxide and carbon monoxide which had been laid down by the Central Pollution Control Board’s revised norms. With fly ash and gypsum lying openly in the unit, there was a high probability of the air containing these chemicals. The board, thus, appeared to have done merely a cursory exercise after release of the NGO’s report and failed to take serious steps to control pollution which was putting the health of the locals at risk. Board’s member secretary SK Singla’s could not be contacted for comments as his cell phone was switched off. However, as per a recent order of the state government the officials had been directed to remain available on their cell phones even on holidays. Chief Minister PK Dhumal revealed this at a meeting with high-level delegation of the British Trade Office authorities of the British High Commission in India. The delegation was led by Paul Grey, head, UK Trade and Investment, and others included deputy head Jane Sanders, regional director, PHD Chamber of Commerce and Industry, Dalip Sharma, here recently. The Chief Minister reiterated that the state was very keen to have an international airport at any one of the suitable places in the state to cater to the travelling requirements of the high-end tourists. “We will welcome investment in the sector by the British entrepreneurs and extend all possible help to the developers,” he assured. He directed the authorities to prepare feasibility report after identification of the appropriate site for the airport. He said the state would welcome investment in the tourism sector where quality infrastructure and development of virgin destinations would be emphasised along with setting up of proposed tunnel and ropeway projects in various parts of the state. Dhumal said the possibility of collaboration with universities in the UK must be explored so that students could get maximum benefit and exposure. He directed the authorities to convene a meeting and also invite representatives from all interested universities in the United Kingdom and HP to explore the possibilities of collaboration. “Certified organic and farm products from the state can be marketed to the UK where the British entrepreneurs can lend their support and hill farmers in turn take benefit from technological exchanges to upgrade their farm products,” he remarked. He said scientific cultivation and extraction of medicinal herbs could be another field where collaboration possibilities could be explored. Paul Grey said it was during the British Rule in India that good educational institutions were established here and the tradition could be revived by having collaboration with the UK universities. About 30 scholars, including some from abroad, in the disciplines of philosophy, both classical and contemporary, linguistics, cognitive neuroscience, and related fields are participating in the conference being held in collaboration with the Indian Council of Philosophical Research. Explaining the theme of the conference, Nirmalangshu Mukherji from Delhi University along with Bijoy Boruah (IIT Delhi) said the human mind had been the subject of philosophical and scientific speculation for many millennia. Only 50 years ago, the study of the mind was christened a “cognitive science”. The conference would throw light on the specific concept of mind and reveal if knowledge of the character of mind truly increased, ever since its systematic study began. He said of late a lot of interest had been generated in the “mind science” in the western world. Director of the institute Peter Ronald dSouza in his opening remarks said Shimla was the ideal location for deliberating on such a philosophical subject as the ancient sages also carried out such pursuits in the Himalayas. The country had a very old tradition in the mind science which was now attracting the attention of others too. Apart from distinguished scholars from India such as Probal Dasgupta (ISI, Kolkata) and Amita Chatterjee (Vice-Chancellor, Presidency University) some renowned scholars from abroad such as Susan Carey (Harvard University), Barry Smith (University of London), Ned Block (New York University), Mohan Matthen (University of Toronto), Guiseppe Longobardi (University of Trieste), Anna Maria Di Sciullo (University of Montreal), Wolfran Hinzen (Durham University) are also participating in the conference. Sood said the country would move ahead only if women, who constituted an important part of the society, were informed about their rights and they could raise their voice against injustice. Shyama Sharma, a former minister, who was a special guest on the occasion, recalled the achievements of prominent women in various fields of human endeavour like social work, politics. She urged the women to take inspiration from them to achieve their goals in life. SP, Sirmaur, Punita Bhardwaj, was also present on the occasion. The chairman of the institute, Rajnish Bansal, also addressed the students. Wearing a traditional turban, the CM participated in a colourful shobha yatra, which was taken out from the local bus stand to the temple of Murli Manohar for offering obeisance to the deity. Later, the CM also visited the exhibition put up in the chowgan. The DC said competitions were being held for the first time in local cultural aspects of Chandroli-Dhajja, Gugga folklore, Bhajans and historical legends, folk dances and folk songs. He said this was an attempt to encourage the new generation to preserve its culture. Additional District Magistrate Darshan Kalia gave away cash prizes of Rs10,000, 7,000 and 5,000 to groups that were adjudged first, second and third, respectively, on behalf of the mela management committee. MANDI: In keeping with the tradition of celebrating the festival of colour a day in advance, the residents today came out in large numbers and played Holi. The chariot of Rajmadhav Rai was taken out from its temple in Damdama palace and it took a tour around the Bhootnath temple. The administration had already declared two local holidays in the town. A crowd gathered at Seri Munch to play Holi. People played Holi till the chariot of Rajmadhav moved back to its temple. KANGRA: Holi without the use of colours was celebrated at old Kangra by the members of the Jain community here on Friday. The three-day Holi festivities began in the famous Septamber Jain Mandir here on Thursday. Hundreds of members of the Jain community arrived from different parts of North India in connection with the festivities. A procession was taken out on Thursday from the Jain temple to the Kangra Fort, and the flag was hoisted at the famous Bagwan Adinath temple amidst chanting of vedic hymns. Kanwardeep Singh, director of the company, said a wrong impression was being created about the project being environmentally damaging. “Not even a single tree has been cut or shall ever be cut in the future as it is a very low density housing project which shall cause minimal pressure on the resources,” he added. He said the piece of land in question had been existing “as such” for the last over a century. He added despite four storeys and parking being permissible in the area, the company intended to have only 24 units with only three storeys each.